Create and manage custom fields for products made with Easy Digital Downloads. Get started with Easy Digital Downloads – Fields now! Right out of the box, Easy Digital Downloads – Fields comes with a set of pre-configured custom fields oriented towards commonly sold product types. Use these fields, customize them or create your own groups! Each field group template has its own set of fields. Add new fields to any group and choose from a variety of field types. No more theme customizations just to make your data display for customers! Fields will automatically output a table of your data on the product page as soon as you add values. No other configuration is necessary. EDD Fields includes a very easy to use widget which will automatically display a table of your custom fields and their values for the current download, or a specific one. Populating fields is as easy as selecting which group of fields to use. On the download edit screen a select field will be available for choosing the field group and then entering in your field values. Custom fields for vendor products too! Frontend Submissions is a powerful extension for Easy Digital Downloads which turns digital stores into marketplaces with multiple sellers. Easy Digital Downloads – Fields fully integrates with Frontend Submissions so that your custom fields can be populated by vendors when they create their own products. Save over 20% when purchasing the Easy Digital Downloads Bundle! Buy the Easy Digital Downloads Bundle and get not just EDD Fields but also Easy Digital Downloads – iDevAffiliate, Project Panorama – Easy Digital Downloads and Easy Digital Downloads – Zendesk all at once for one low price. Check it out here! EDD Fields gives site owners greater control of product data and is an excellent tool to help build better stores. It’s awesome. 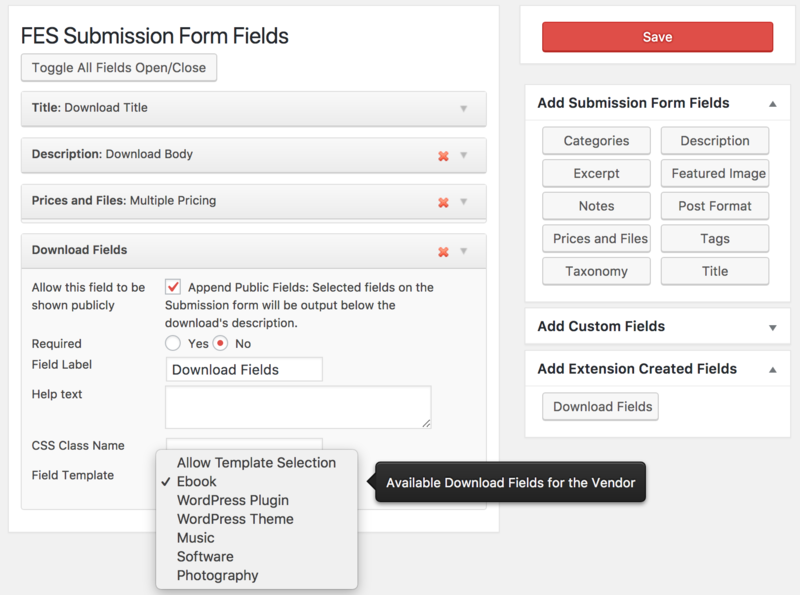 There are tons of ways in WordPress to add custom fields to content. But there is nothing that even comes close to being as easy as EDD Fields when it comes to working with Easy Digital Downloads. Everything is already done! Just activate and starting adding product data. It really is that simple. Subscribe to our newsletter to receive special discounts, new product announcements and helpful resources from Real Big Plugins.